RBTH looks back at the remarkable life a Russian revolutionary, who moved to Japan and became an eminent philosopher, academician and scholar of Japanese classics and Shakespeare. The best way to talk about Alexander Vanovsky is to make a TV series in his honor. Only a TV series can cover a life that included an aristocratic childhood, a revolutionary youth with time in prison, and a philosophical adulthood marked by an interest in English literary classics and Japanese antiquity. Alexander Vanovsky was born in 1874 in a family of an army officer, who lived south of Moscow. He graduated from the cadet corps and the military academy, but did not become an officer. Under the influence of his elder brother, he developed an interest in revolutionary ideas that were popular in 19th century Russia and became a professional fighter against the Tsarist regime. In 1898, Vanovsky was one of the 9 delegates of the underground rally in Minsk, which then formed the social-democratic worker's party of Russia. This was the same party that 19 years later would lead the country to the revolution. Immediately after the rally, Alexander was arrested and sent to exile in the north. As soon as he was freed, he joined the revolutionary movement again and landed in jail once again. He got out in 1905, while a revolution was beginning in the country. Vanovsky became one of the coordinators of the armed uprisings in Kiev and Moscow, where with his squadron he tried storming the Kremlin. He was devastated by the number of deaths that the street clashes caused. As a result, he no longer wanted to change the regime at such a price, and gradually started distancing himself from the revolutionary battle. He remained underground for the next few years and wrote articles on revolutionary theory. During this period, he spent a lot of time with his younger party friend Vladimir Lenin and even lived with him in Europe. But in 1912, Vanovsky officially left the revolutionary movement and abandoned the political fight. This led to a break-up with his old friends and his family. His wife was also a revolutionary and could not accept her husband's decision. Vanovksy then became passionately engrossed with the works of Shakespeare, especially Hamlet. He spent the next two years underground, meticulously analyzing the works of the English bard. When World War I broke out, he surrendered himself to the police so that he could be pardoned and then sent to the front as an officer. The second step was made when Vanovksy was wounded and sent to the Far East and the third was when in 1919 he was sent to Japan to be cured of his “psychological illness.” Alexander Vanovsky never returned to Russia. Japan absorbed him fully and immediately. 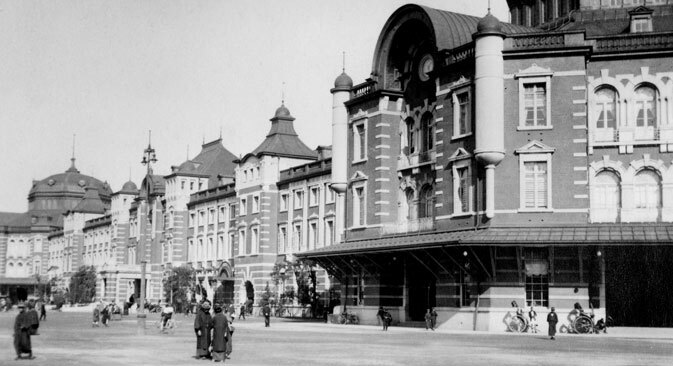 Having settled down in Yokohama, Vanovsky fell in love with the city and the country. An impressionable person, he studied Japanese geography and history, was enchanted by its volcanoes and earthquakes, and even wrote a big book titled ‘The Japanese Hero,’ dedicated to Mount Fuji. He described the mountain as a mystical “keeper of happiness and peace of the Japanese people.” In August 1923, he tried to convince his friends to leave Tokyo, which, in his opinion, was threatened by an earthquake. No one listened to him, and on the tragic day of September 1, 1923 when the Japanese capital witnessed a massive earthquake, Vanovsky was alone in Hokkaido. The only thing that Vanovsky did not have enough of in that period was Russia. In 1926, he received permission to return to his homeland, but just as he was preparing to go back, his daughter arrived in Japan and told him about life in the USSR. As a result Alexander Vanovsky decided to stay in Japan. He continued teaching in Waseda, made comparative studies of Pushkin's, Shakespeare's and Moliere's religious outlooks, and studied the Kaidan Japanese folktales and religious mysticism in various cultures. In the 1940s, Vanovsky was considered one of the greatest Shakespeare scholars in Japan. In 1941, he finished writing the book ‘Volcanoes and the Sun,’ which was published after the war and called “a work of genius” by the Sinto newspaper in 1961. The paper called it a book that revealed the profound essence of the Japanese people. His students at Waseda would later become professors, while Vanovsky himself continued his research, having become a unique legend in the Japanese community of philosophers. Alexander Vanovsky died in Tokyo in 1967. In accordance with his wishes, Vanovksy was buried where he enjoyed being the most during his life: on the foothills of Mount Takao, near Tokyo.